I love imaginative play. I think it is a great way for children to learn and grow while using their imaginations. I also love puppets! Cate and Levi is a sweet little company that makes one of a kind, all natural and reclaimed material high quality children's items. They have the cutest stuffed animals, baby blankets, backpack buddies, and much more. 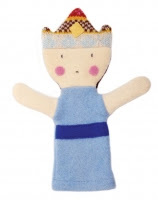 We were lucky enough to review one of the People Puppets, the Princess to be exact. This puppet is so sweet! It is a whole lot bigger than I thought it would be, the picture does not do it justice. The quality is outstanding. I know that my little princess is kind of young to play with the puppet as it is meant to be played with, but it is something that she will grown with and cherish for years to come. I love the color choices and the fact that each puppet is unique really makes me smile. What I also like about Cate and Levi items is that every item is non toxic, eco-friendly and one of a kind. The rainbow of colors and textures reclaimed wool possesses gives their artisans the freedom to craft truly unique animals. If you are looking for a truly one of a kind item or gift this is the place to shop, you will not be disappointed!! Which People Puppet would you choose if you won? i love the nurse puppet! cute!!! I would get my son the fireman puppet! i would like the pirate puppet. I liked Cate and Levi on facebook. I added my circle to FrugalFamily Tree. I'd pick the fireman since my husband is a fireman. I would choose the Princess and Nurse if I won! If I won, I'd choose the Pirate! we would choose the fireman! I would get the pirate! Too cute. Liked Frugal Family new page on Facebook. Liked Cate and Levi on Facebook. Thank you for the giveaway. I would choose the Fireman for my nephew because his dad is a fireman. kristiedonelson(at)gmail(dot)com Thank you. Like Cate and Levi on Facebook. Kristie Morrison Donelson. kristiedonelson(at)gmail(dot)com Thank you. Follow Cate and Levi on Twitter. @kdonelson. kristiedonelson(at)gmail(dot)com Thank you. Follow you on Google +. Kristie Donelson. kristiedonelson(at)gmail(dot)com Thank you. I would like the pirate or the nurse, both really cute.